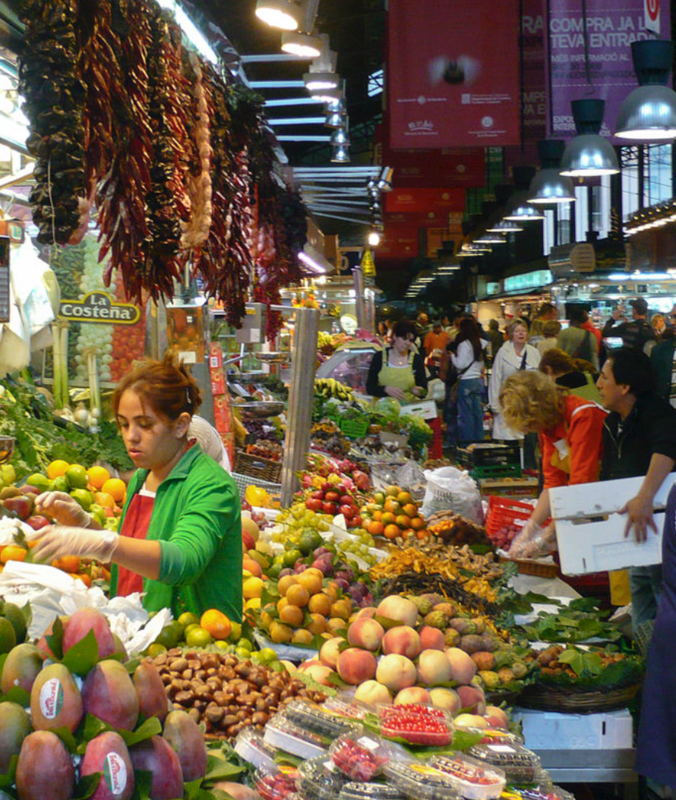 Every neighborhood in Barcelona is blessed with its market. Locals have the convenience of grabbing fresh and organic products anytime they want all the while appreciating the beauty of their very own market. It’s also important to notice how, unlike supermarkets, which tend to sell plastic-wrapped products, public markets are as much sustainable as they are enjoyable. Of course, we can’t talk about public markets without mentioning the Mercat de Sant Josep de la Boqueria, or simply “La Boqueria”, as it is one of Europe’s most famous food markets. Conveniently situated on La Rambla, it has a very diverse selection of fresh, locally sourced produce. We’re talking seafood, candy, chocolate, fresh-pressed juice, delicacies – just to name a few. A walk through this market will engage your every sense with smells ranging from pastries to newly-harvested fish and with the multitude of colours from the fresh fruit and vegetables. La Boqueria also holds many tapas bars from which you can get delicious food-to-go. Address: La Rambla 91, 08001, Barcelona. If you are on the search for obscure treasures, head over to the Mercat dels Encants, one of Barcelona’s largest and best-loved flea markets. A variety of items are sold, old and new, and although there is a lot to go through you will come across some rare gems. The trend here is vintage – you can find anything, from old clothing to rusty tools to classy antiques. But be careful where your kids are looking because adult videos are not off the table! Address: Avinguda Meridiana 69, 08018, Barcelona. Although no longer a functioning market, you should still pay the Mercat del Born a visit for its impressive architecture and historical contents. Inaugurated in 1878, the building served as Barcelona’s wholesale public market for almost a century before closing down in 1971. The future of Mercat del Born fuelled many debates, with plans to re-open it either as a market or a library. However, the discovery of significant ruins during its renovation lead to the decision to convert it into an open (free!) museum. And, let’s be real, learning about Barcelona’s history is always trendy. Address: Carrer del Comerç 2, 08003, Barcelona. This is just a short list of the several public markets in Barcelona. So, to our fellow art lovers, bookworms, foodies and collectors, join us for some worthwhile spending at your favourite public market!